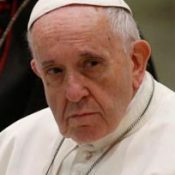 Pope Francis’ inflight press conference during his return from Ireland certainly did not give the impression of a man who had just been implicated in a major cover-up causing a worldwide scandal of major proportions. His answer to a simple yes or no question from a reporter was puzzling, to say the least, as that answer was coming from Christ’s representative here on Earth. The top Vatican representative in the U.S. from 2011 to 2016, Archbishop Carlo Maria Viganò, had just accused him of deceit and cover-up regarding ex-cardinal McCarrick. At the very least, even if we were to consider Viganò’s testimony suspect, we would conclude this was a scandalous assault on the Catholic Church and the Pope himself. Any righteous man would defend his honor and his good name with a reaction worthy of a man falsely accused….What father or what leader would not be outraged at false allegations leveled at his family or at his integrity as a leader? At the press conference, there was clearly no evidence of any indignant outrage at the allegations against the papacy from our Holy Father regarding the Viganò allegations. Instead, Pope Francis asked the reporters to read the testimony of Archbishop Viganò and to draw their own conclusions. Who would leave their defense to a group of media reporters to determine their guilt or innocence in such a grave matter? For 2,000 years, people have looked to the Chair of Peter for moral credibility. If we are to believe Archbishop Viganò, we must conclude that the Pope has violated his own zero tolerance rules, which mortally wounds his own moral credibility. The Chair of Peter will not support a hypocritical occupant. As the lieutenants fall on their swords around him, it will not be enough for the general not to fall on his. The Dubia card cannot be played this time around — the silent treatment ain’t gonna work. As of this writing, more and more leading clerics are coming to the defense of the nuncio and more will come. The longer the Vatican stonewalls and the hierarchy continues to break ranks, the closer we come to a palace coup in some form or another in the coming weeks..